The Etruscans, who lived in Etruria, were known as Tyrrhenians by the Greeks. They were at their height in Italy from the 8th to the 5th century B.C. Herodotus (c. 450 B.C.) reports, as a theory of their origin, that the Etruscans came from Asia Minor. Recent work on DNA in cattle suggests Herodotus may have been right, although some still consider them indigenous to the Italic peninsula. The Etruscans lived in what is modern Tuscany, in the area bounded by the Tiber and Arno rivers, the Apennines and the Tyrrhenian Sea. 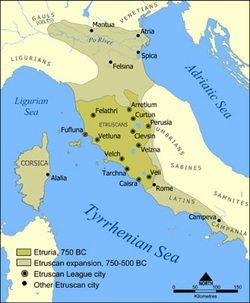 The Etruscan economy was based on agriculture, trade (especially with the Greeks and Carthage), and mineral resources. Herodotus says the Etruscans came from Lydia, in Asia Minor, as the result of a famine around 1200 B.C., like the Irish coming to the U.S. as a result of a potato famine in the 19th century. The name of the Etruscans, which was Tyrrhenian or Tyrsenian, according to the Greeks*, came from the leader of the Lydian émigrés, King Tyrsenos. The Hellenistic scholar Dionysius of Halicarnassus (c. 30 B.C.) quotes an earlier historian, Hellanicus (contemporary of Herodotus), who objected to the Lydian origin theory on the basis of differences between Lydian and Etruscan languages and institutions. For Hellanicus, the Etruscans were Pelasgians from the Aegean. A stele from Lemnos, an island in the Aegean, shows writing that appears similar to Etruscan, a language that remains a puzzle for historical linguists. [See Novilara Stele.] Dionysius' own opinion on the Etruscans' origins is that they were autochthonous residents of Italy. He also says the Etruscans called themselves Rasenna. Successors of the early Iron Age Villanovans (900-700 B.C. ), Etruscans built such cities as Tarquinii, Vulci, Caere, and Veii. Each autonomous city, originally ruled by a powerful, wealthy king, had a sacred boundary or pomerium. Etruscan homes were mud-brick, with timber on stone foundations, some with upper stories. In southern Etruria, the bodies of the dead were buried, but in the north, the Etruscans cremated their dead. Much evidence about the early inhabitants of Italy comes from Etruscan funereal remains. The Etruscans exerted a heavy influence on early Rome, contributing to the line of Roman kings with the Tarquins. The possible, but debated dominance of the Etruscans ended with the Roman sack of Veii, in 396 B.C. The final stage in the Roman conquest of the Etruscans was when the Volsinii were destroyed in 264 B.C., although the Etruscans maintained their own language until about the first century B.C. By the first century A.D. the language was already a concern for scholars, like the Emperor Claudius. Most consider the Etruscans a great mystery, but see Common Errors (21): Etruscan Origins.